Carnival of Space #43 has a special Academy Award theme this week. Check out the many Oscar Edition "winners" over at Starts With A Bang. I couldn't resist linking to that panspermia graphic. Reminds me of a sacred Monty Python song that I best not get stuck in my head. Damn, too late! OK, just don't sing it at the office. Stick to whistling. I just received the DVD of In the Shadow of the Moon, a movie that I saw and really enjoyed last fall when it was in limited theatrical release. I'm looking forward to seeing it again this weekend. It's so good that even some of my non-space-freak family members might enjoy "meeting" some of the Apollo astronauts as real people looking back at the achievements and emotions of their younger days. And speaking of Moon shadows, imagery released by NASA today of of the Moon's south pole region is pretty impressive. 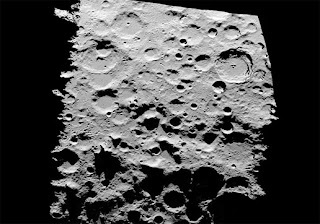 That is some really rugged terrain, and Shackleton is one humongous crater. The animation of a spacecraft landing on the edge of Shackleton is great, and really gives a sense of scale, but I think the coolest one is the lunar illumination movie (1.6 MB QuickTime). There are some areas there that stay very, very dark and cold. And icy, we hope. Landing anything there will require careful planning and preparation, and this is a good start. Bill Stone, take note. From the Kingdom of Tonga, to Space? I'm not sure how the private space company Interorbital escaped my attention - I guess their PR isn't as good as SpaceX, Scaled Composites, Bigelow, and Virgin Galactic. They've done some press releases recently but I just noticed them in a blog post at Colony Worlds. It appears that they have been around since 1996, just down the flight line from Burt Rutan and company in Mojave. They've been building and testing rocket engines, and planning for sea-based launches of microsatellites sometime soon. They are also selling tickets ($2.5 million) for orbital space tourism flights on their Neptune starting in late 2009. These things will launch from the water - not from a boat or sea platform, from the water. Polar launches off the coast of California, equatorial launches from near the Kingdom of Tonga (south Pacific, near Fiji). But wait. Orbital? Starting in late 2009? And just the other day I said that SpaceX's Falcon 9 and Dragon flight plans sounded like an amazing schedule (unmanned cargo test flight to the ISS by the end of 2009). Interorbital hasn't flown anything yet, but they have passengers signed up, and if the 2009 thing works out (which somehow seems doubtful considering they haven't flown anything yet), they may even beat Virgin Galactic's SpaceShipTwo into commercial service. Of course SS2 is "only" suborbital (and tickets are "only" $200K) and it hasn't flown yet either, but Rutan did do that X-Prize thing in 2004 with SpaceShipOne. It's looking like the wild wild west out there! I sure hope some of it comes true. Guess I better start saving for one of those later flights (I want to give them time to make sure that "tunnel through the heat shield" thing works out). Interorbital also has some sort of promotion going for a less expensive way to fly ($250,000), something like an expensive lottery I guess. I suppose I'm a bit skeptical because it all comes across as a sort of shoestring operation (a web site can really make an impression), though I really hope it works out as they say. Just the idea that they are talking about orbital vacations starting next year - hey, that's wild. I've written a lot recently about AMSO, an amazing Apollo program add-on for Orbiter. If you would like to see how good a free add-on for a free simulator can be without installing and trying it for yourself, check out this very well produced 11 minute video from Tex-Films, Apollo 11: Remastered. Great job, Tex! Back in the late 1980's, I went through a period of being pretty pessimistic about the future. With Reagan in the White House and the US and USSR armed to the nuclear teeth, I read books like Jonathan Schell's The Fate of the Earth and really believed it would be a miracle if we made it to this century without a nuclear war. Fortunately I was wrong about that, and while the world remains a dangerous, violent, and messy place, I'm somewhat more optimistic about the future. I believe that technology, education, and the wider recognition that we are all sharing the same small planetary boat may help us survive for a while longer. My interest in space and in educational outreach is related to this belief. International cooperation in space won't save the world, but it helps. Encouraging kids' interest in science and technology can also help. And so on. But what about the Dark Side? While always in favor of cooperation and non-violence, I have also enjoyed naval strategy games and combat flight simulators with titles like "Total Air War." I also have read and enjoyed a large number of war novels and technothrillers, including a few classics by Tom Clancy (before he became so successful he could give up editors and have other people write his books for him). His WW3 novel Red Storm Rising was one of my favorites. I noticed in the supermarket yesterday that Clancy is bringing back WW3, now set around 2020 and with a new but still quite familiar cast of characters. Tom Clancy's EndWar (written by David Michaels) is a new technothriller that is also a tie-in to an upcoming video game called EndWar (as you might imagine, the title is ironic). Although I don't personally play RTS and similar games, the video preview and interviews on the game make it sound pretty impressive (a lot of the game development seems to be in Shanghai). Based on the Amazon reviews, I ordered the book to read on my next trip. Why? Well, I still do like the occasional technothriller, and I'm also curious about the premise, which as it happens involves the militarization of space as well as more fighting over oil. The book and game apparently put you in the middle of a global conventional war which had erupted a few years after Iran and Saudi Arabia had destroyed each other in regional nuclear war in 2016. I will let you search for more information or read the book if you'd like to know more, but for some reason the fictional 2016/2020 events that I read about struck a nerve. Will the period from 2010 to the 2030's and beyond be a new golden age, in which technology and international cooperation help to solve many of the problems that plague us today, and in which we start to become a spacefaring civilization? Or will it be more along the lines of Clancy's imagination? I don't know, maybe neither. But I really think we ought to start building lifeboats just in case. P.S. I jumped the gun and read Tom Clancy's EndWar in about 5 hours the other night. It's definitely an exciting and sometimes thought-provoking read, fast-paced, high-tech military fiction with some political background. Not as deep or good as Red Storm Rising, but quite a good read for a video game teaser. For a bunch of "space geeks," the Orbiter community is pretty cool. 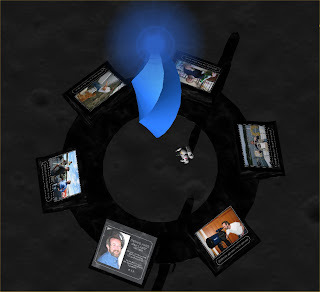 Today I participated in an unusual memorial service that took place (virtually) on the Moon, within Orbiter itself, and which is part of the latest release of the AMSO Apollo simulator whose main author is Alain Capt, known as "ACSoft" on the Orbiter forums. Although Alain is the main author, AMSO includes contributions from a number of other people. One of its key features is the autopilot that allows you to land safely on the Moon (it also allows some manual overrides, similar to the real Apollo autopilot software). This brilliant piece of programming was provided by Dennis Hare, known on the Orbiter forums as "LazyD." Sadly, Dennis passed away suddenly last year. While many people expressed their sympathies at Dennis' passing in forum comments, Alain created a special tribute within the software itself. 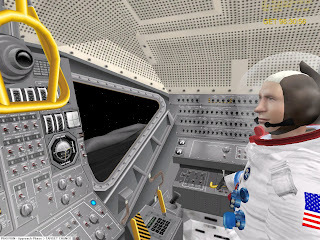 He constructed a virtual monument at the Apollo 17 Taurus-Littrow site, and provided a special scenario which uses LazyD's autopilot to land you near this site. You can then drive the Lunar Rover to the memorial and plant the US flag there. This triggers a musical and graphical tribute to Dennis, with a sort of "eternal flame" as well as several photographs of Dennis with comments about his life. I've included one of my screen shots above (you can see more here). I personally never knew Dennis, though I would have liked to - he was close to my age and shared some of my interests such as flying, astronomy, software, and Orbiter. As Alain discusses in his notes on the tribute, I too have experienced close friendships through the internet, as he had developed in working and talking with Dennis (Alain lives in Switzerland, and Dennis lived in Lopez Island, Washington). So I know this must be a real loss for him. I would like to express my condolences to Dennis' wife and family, and to also thank Alain for remembering him in this special way, and for sharing this with the Orbiter community. Thanks to Next Big Future (via the Carnival of Space), I learned about some recent developments at SpaceX, including the success of a preliminary design review with NASA for their Dragon spacecraft (unmanned cargo version) to approach the ISS on a test mission. The plan is for a first launch of Falcon 9 with Dragon for a brief (5 hour) non-ISS test mission in the fourth quarter of this year, followed by an extensive 5-day "station keeping" ISS test mission in Q2 2009. Then in Q3 2009, there would be a full Dragon test mission to the ISS, including approach and "mating" (with an empty cargo capsule). 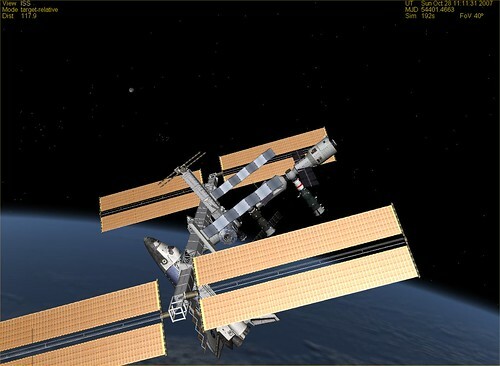 The brief video above shows how docking will work. This is an amazing schedule, and I hope it all works out. They have been doing test stand multi-engine firings for the Falcon 9, but no test flights so far (the first demo flight of Falcon 9 is also scheduled for Q4 of this year). Attention Orbiter add-on builders: is anyone working on add-ons for the Dragon spacecraft and Falcon 9 launch vehicle? These puppies will be flying soon! There is a Falcon 1 add-on available - just downloaded it to try. I'm a few days late in pointing it out, but Chris Lintott is hosting this week's Carnival of Space #42. I've found a couple of interesting nPublish Postew blogs there this week, in addition to some old favorites. Here is one of those problems that is nice to have: I keep discovering cool new music and rediscovering older music I used to like but forgot about, in part because I only ever replaced a fraction of my collection of vinyl records with CD's or digital tracks. A couple of years ago I got some software, hooked up a turntable to my PC, and "ripped" about a dozen rediscovered albums to mp3 files. But that took a lot of time and the quality wasn't always that great, so I gave up. With 11,660 songs in iTunes, it's not like I'm hurting for variety. 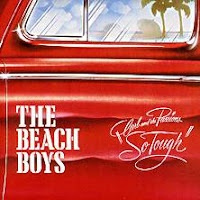 The Beach Boys, "Carl and the Passions - So Tough" - great harmonies from 1973. Donovan's Greatest Hits - Spacey in the old-fashioned, 1968, trippy way. The Doors, "Waiting for the Sun" - A 1968 favorite. Paul McCartney, "Flaming Pie" - Came out in 1997, but I never listened much. He can be sappy at times, but I love McCartney's melodies. Van Morrison, "Avalon Sunset" (1989) - Van is the man. Good songs, fine singing. Rilo Kiley, "Under the Blacklight" (2007) - Jenny Lewis & company are a new indie favorite. Sara Bareilles, "Little Voice" (2007) - Her voice is not so little, and her songs are great ("Love Song" is on the radio a lot but don't hold that against her). Iron & Wine, "The Shepherd's Dog" (2007) - Cool songs with breathy, mysterious-sounding vocals. Anoushka Shankar, "Rise" (2005) - I'm not into a lot of Indian music, but Ravi's other daughter is also amazing. 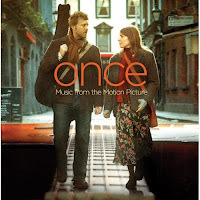 "Once," movie soundtrack - I really liked this 2007 movie about a couple of songwriters in Dublin. A truly natural musical with songs mostly by Glen Hansard of the Frames. I guess I'll skip putting in more links - you can use Google or Amazon as well as I can I'm sure. iTunes/iPod Tip: I just discovered "smart playlists" in iTunes. This allows you to define the contents of a playlist based on various conditions (artist, length, style, dates, etc.). I used it to create some dynamic folders of recently added music, e.g., the "last two weeks" folder updates automatically each day. Over at my Flickr site, I've started to add some additional pictures of the now-released Mars for Less for Orbiter add-on. I created a new photo set for MFL to make it easier to see what's there. The picture here shows EVA astronauts performing Earth-orbit assembly of the two separately launched components of the MTSV (Mars Transfer and Surface Vehicle, better known as "the hab"). While the propulsion modules could probably be designed to be "self-assembling" via automated docking, assembling two large parts of a crew vehicle with all the structures, plumbing, electrical systems, etc. would probably require ISS-like on-orbit assembly by astronauts. Although it's not included in the add-on, in this picture, I show a proposed t/Space CXV crew vehicle, an Orbiter add-on by Kodiak. I briefly experimented with using this as a vehicle to carry astronauts up to the Mars ship for assembly, testing, etc. I'm not sure of the status of the air-launched CXV crew vehicle. I hope someone will eventually make Orbiter add-ons for SpaceX's Falcon 9 and Dragon (a private crew vehicle which is being funded and built), but I haven't seen any yet. 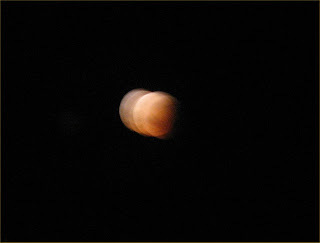 While my hand-held eyepiece digital camera shot leaves much to be desired, visual conditions for tonight's total lunar eclipse were just perfect (aside from the cold). I set up my little Orion Starblast telescope on the front porch and got some really wonderful views of the partial and total stages of the eclipse. The burnt-orange colors were great. I got some nice views of nearby Saturn too. This makes up for a lot of cloudy nights in recent weeks. No time to say much tonight beyond "in-freaking-credible" about the new version of ACSoft's free Apollo program add-on for Orbiter, AMSO 1.16. I just downloaded it (66 MB!) and tried a few scenarios to check out the improvements. Now with 3D virtual cockpits and astronaut figures as well as improved exterior models, it is simply beautiful. There are even clouds of dust as the LM gets close to the lunar surface for landing. Check out the updated gallery for an idea of the work that has gone into this thing. Bravo! Mars for Less: We Shipped! 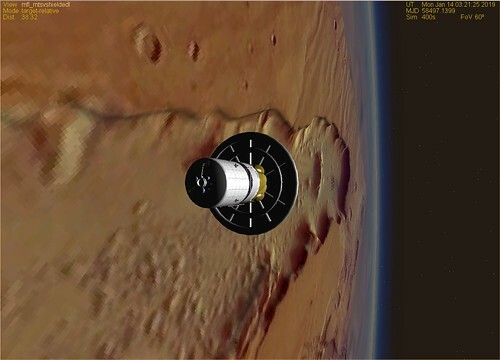 As a software project, it was only natural that Mars for Less for Orbiter would be late, even though it was essentially done back in August 2006. After the big push for the Mars Society paper that summer, I think we just ran out of energy for tying up the loose ends. But thanks to Andy and Mark, MFL has finally "shipped!" Mars for Less V1.6 (24 MB zip file) is now available for download over at Orbit Hangar. Be sure to read and follow the included documentation on this, both for installation advice and usage tips, and note that it does assume pretty good familiarity with Orbiter. A forum discussion thread has been started here. Mars for Less: Coming Soon. Really. It has said "close to being publicly released" on this page since fall 2006, but now the Mars for Less add-on for Orbiter really is coming soon. Andy McSorley and Mark Paton have pulled together the files and finished up the basic documentation, and I've contributed a few edits and a bit of final testing. The add-on itself fills up a 23 MB zip file, and there are a bunch of additional add-ons recommended for the full experience, all described in the documentation. There are many scenarios to try. I had forgotten how cool this stuff was since I was immersed in it for a few months in spring/summer 2006, working closely with Andy and Mark on the add-on parts and scenarios, and culminating in our paper and presentation at the 2006 Mars Society Conference, "Virtual prototyping of human Mars missions with the Orbiter space flight simulator" (the paper and slides can be downloaded from the bottom of this page). Is Damn Interesting a web site or a blog? I'm not exactly sure, but it does often live up to its name on a wide range of topics by a number of different writers. A case in point: this post on late World War II plans for a very strange super weapon by Third Reich researchers. It combines optics and space with a sadistic Nazi-amplified nostalgia for burning ants with a magnifying glass. It's very bizarre, as are most of the hundreds of comments in response to this post, most of which have nothing to do with the post itself. Damn interesting indeed, and not just the posts on space exploration. The National Academy of Sciences has some great new material that may come in handy if you ever get into a discussion with proponents of so-called "creation science" or "intelligent design." Science, Evolution, and Creationism is a free 88-page PDF e-book, and there is also an 8-page brochure that provides a quick summary of the key points. One of the things that seems to confuse people about evolution (and science in general) is the word "theory." It has a very specific meaning in the context of science, and it doesn't mean the same thing as in common conversation. If you have a theory about who has been eating your secret stash of cookies at the office, it means a sort of a hunch, or perhaps an informed guess. As explained in the NAS brochure, a scientific theory is quite different: "In science, the word theory refers to a comprehensive explanation of an important feature of nature that is supported by many facts gathered over time. Theories also allow scientists to make predictions about as yet unobserved phenomena." The theory of gravity is such a theory - it doesn't mean that scientists have a hunch that there might be gravity. It means that they understand gravity in a very detailed and systematic way, and they can use this understanding to (for example) design spacecraft trajectories. Scientific theories can change over time as new observations and experiments are done. Newton's theory of gravity provides an extremely good approximation that still works well for most purposes (including satellite operations). Einstein's General Theory of Relativity confirms the predictions of Newton in most respects, but also accounts for some usually small effects that Newton's theory cannot (sometimes these effects are not small, e.g., black holes). The theory of evolution is similarly well understood so it can be used to explain observations in the fossil record, Earth's biological diversity, changes in DNA among different organisms, and practical applications such as the ability of bacteria to develop resistance to antibiotics. Evolution is an observed fact. The theory of evolution is a comprehensive explanation of how evolution works and forms the core of modern biology and medicine (with applications in other fields too). The fact that this is even up for debate among educated people in the United States is a bit embarrassing, but there you go (at least Huckabee seems to be out of the running in the presidential race). This new material is a good resource for when this does come up. According to a news release today from JPL, studies based on infrared observations from the Spitzer space telescope indicate that many, and perhaps most nearby Sun-like stars may form rocky planets (estimates range from 20% to 60%). This is based on analysis of multiple infrared wavelengths associated with rings of dust around the stars (neither Spitzer nor Hubble can directly detect small Earth-like planets even for nearby stars). In about a year (February 2009), NASA will launch Kepler, a mission specifically aimed at detecting Earth-like planets in the habitable zone around nearby stars. Kepler won't be able to directly image these planets, but instead will use the the transit method to detect the slight dimming caused by a small planet passing in front of its much larger sun. 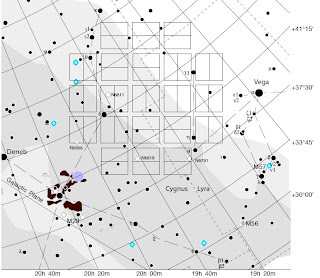 It will literally stare at a single region of the sky for over 3 years to collect photometric data on around 100,000 stars in a patch of sky between Deneb and Vega (see graphic). Since the transit method depends on the planet passing the star across the line of sight to Earth, only a very small percentage of stars with such planets will be "aimed the right way." This is why they will need to monitor 100,000 stars for over 3 years (because like Earth, these small planets would need to be moderately far from their star to be "habitable" and therefore would have a period of something like an Earth year). 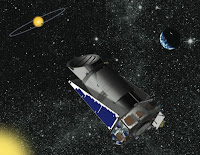 The dust-based Spitzer studies (being presented this week at the AAAS conference in Boston) are encouraging for Kepler's planet-finding prospects. If the optimistic end is right and 60% of sun-like stars have rocky planets, then Kepler could detect a pretty decent harvest of well-aimed rocky planets. "I look forward to some odd things," Tani said. "I'm looking forward to putting food on a plate and eating several things at once, which you can't do up here. I'm looking forward to spitting my toothpaste out in a sink rather than swallowing it." "I love living here on the station. It's comfortable. It's fun. It's exciting. The view, of course," said Tani, a 47-year-old mechanical engineer and the father of two young daughters. "But obviously, I want to get back and see my family." Here's another interesting person I "met" through a TED conference video. Bill Stone is an explorer and engineer who isn't afraid to go the extra mile, even if he has to build a robot to do it, and even if the extra mile is straight down, or at the Moon's south pole, or under the ice of Europa. Stone has done some serious deep cave exploring, and his company, Stone Aerospace has built some amazing underwater equipment to aid in exploring deep underground bodies of water. He has extended this to autonomous vehicles (robots) that have explored, imaged, and measured otherwise inaccessible underground lakes. NASA is now testing Stone's latest vehicle, ENDURANCE, in a Wisconsin lake, in preparation for more challenging tests in Antarctica. A future and presumably smarter version of this robot could someday search for life in the under-ice ocean that is thought to exist on Jupiter's moon Europa. Of course drilling through kilometers of ice to get to the water is a big problem, but people have thought about that too, as shown in this video (the Europa part starts around 5:00, the landing around 6:30 - too bad the JIMO mission was canceled, but someday...). As with caves on Earth, Stone is not content to leave all space exploration to robots. 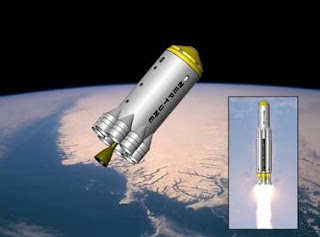 Near the end of the TED video he describes a proposed mission to establish a base at the Moon's south pole, where ice would be mined and converted to rocket fuel and oxidizer, including the propellants needed to get his mining team home (I'd guess that this would be great motivation for getting everything to work). Yes, his mining team - Stone proposes that this mission would be privately funded, and he intends to personally lead it. By 2015. It will need some serious robot assistance. And some serious rocket support, not to mention crew vehicles and lunar landers (he's not counting on NASA for any of this). This is certainly a bold and exciting idea, and it's not only for the adventure - Stone proposes that space-based fuel depots will be the key to opening up space for private enterprise. I hope he's right and that he met a lot of "angels" and "super-angels" at that TED conference. He certainly doesn't suffer from lack of ambition. Check out Carnival of Space #41 over at New Frontiers. This one is a Really Big Show, the largest number of space and astronomy posts in a single space carnival so far. The post descriptions are pretty thorough so it makes for a good and informative read even if you don't have time to check out all the blogs right now. There's a nice post today over at Universe Today, I Heart the ISS: Ten Reasons to Love the International Space Station, written by Nancy Atkinson. While it gets little respect or attention from the public at large, the ISS is one of the most incredible engineering projects in history and an impressive demonstration of international cooperation. And that's just two reasons to love it (my Orbiter shot is from STS-120 and doesn't include the new European Columbus module that was successfully installed this week). Thanks to Orbiter, I have virtually flown to and docked with the ISS many times. Even in the simulation it's exciting to see it grow from a small dot to a giant satellite as you rendezvous and dock in your space shuttle (or in some futuristic space vehicle). If you have Orbiter (it's free), you can watch a flight recorder replay of rendezvous (called "sync" in Orbiter) and docking using the standard "Deltaglider" (DG) spacecraft rather than the shuttle. The DG's docking port is in the nose rather than on top as in the shuttle, which makes docking a little easier to master. The annotated replay is in the Tutorials folder and is called "DG-ISS Sync Dock." I recorded and annotated this replay to include with the 2006 release of Orbiter. There are detailed instructions to go with this tutorial replay in chapter 5 ("Dancing in the Dark") of my ebook Go Play In Space if you want to learn what's involved in getting to the ISS. You can also learn about Orbiter docking in videos, here and here (this shows how to dock the shuttle with the 1999 version of the ISS - it's grown a lot since then). If you prefer your ISS information in traditional book form, I highly recommend the 2004 edition of Marianne Dyson's book Space Station Science. Like Orbiter and the ISS itself, it's not just for kids. In addition to recently experiencing the Cirque du Soleil show "The Beatles LOVE" and seeing the movie "Across the Universe" again (just bought the DVD), I've been reading the book Here, There, and Everywhere by Geoff Emerick, the recording engineer who worked with the Beatles and George Martin on most of their recordings from Revolver to Abbey Road. Although Emerick made major contributions to the innovative recording techniques and sounds used on the Beatles' records, he's really pretty modest about it - just doing his job, after all. He has a lot of great stories, and although he wasn't involved with the Beatles very much outside of EMI's Abbey Road studios, he spent a lot of time with them over six years and watched them grow and change in many ways, musical and otherwise. He also worked with Paul McCartney on several solo recordings after the Beatles broke up, from Band on the Run (recorded under rather trying conditions in Lagos, Nigeria in 1973) to very recent McCartney projects, so his relationship with Paul has been much closer than with the other Beatles. As a songwriter, singer, and occasional "recording artist" (of a fashion) myself, I really love this stuff. It also takes me back 40 years or so. At this time in February 1968, the Beatles had just recently recorded Paul's "Lady Madonna" and John's "Across the Universe" (though John was unhappy with his vocals and it was put aside and not used as the B-side of "Lady Madonna" as planned - George's "The Inner Light" was used instead). I was a high school sophomore who had only recently discovered pop music. For reasons I find hard to understand now, it took me until late 1967 to finally get excited about the Beatles. "Hello Goodbye" b/w "I Am The Walrus" (November 1967) was the first Beatles single I bought, followed by the "Magical Mystery Tour" album a few weeks later. I caught up on other Beatles albums through 1968 and remember being especially obsessed with "The White Album" for weeks and weeks when it was released in late November. According to Emerick, this beautiful record was made under most chaotic and stressful circumstances. Not surprisingly, this is also when I first started to learn to play guitar. Of course 1968 would turn out to be quite an eventful year with the Vietnam War, assassinations, demonstrations, political chaos, and on the exciting and positive side, the first visible achievements of the Apollo program, Apollo 7 in October and Apollo 8 in December. I feel lucky to have been around and open to the inspiration of both Apollo and the Beatles in that strange and wonderful year. There's an excellent article in this week's Space Review, "Somewhat as a clamor in the wilderness" by Bob Mahoney. 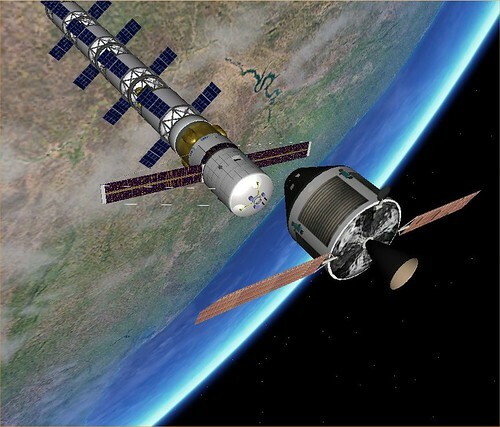 He discusses the continuing controversy among space aficionados regarding the design choices made in NASA's 2005 ESAS (exploration space architecture study, famously referred to by Mike Griffin as "Apollo on steroids"). He compares this to discussions in the very early 1960's on the "Apollo mode decision," which ended up to be lunar orbit rendezvous (LOR). There was similar passionate debate about this at the time, but once NASA chose LOR, everyone got behind the decision and made it work (which of course it did very well). The difference is that more than two years after the ESAS decision, there is still a lot of passionate and sometimes bitter discussion of the choices. Some Constellation critics may be less technically qualified than others to criticize NASA's decisions, though there are many knowledgeable critics, and some staunch defenders clearly have vested interests. But Mahoney points out that the major failing of ESAS and of NASA in promoting it is that it has failed to truly engage or inspire the public. As he says in one of his subtitles, "ESAS: That's It?" Even if it is technically well-grounded, NASA has done little to connect what seems to many to be a scaled-up replay of Apollo with an exciting and potentially world-changing vision of a future spacefaring civilization. And where the public goes, politicians often follow. If space isn't something that inspires people, then it may as well be just another federal program to a congressperson or new president looking for things to trade or cut. I was struck by a similar feeling when I reviewed the AMNH/NASA "Field Trip to the Moon" DVD yesterday. It may have educational value, but it was just OK, and the NASA visuals were really not that impressive. I'm certainly not the most talented speaker or educator you could find, but I can fire up a free space flight simulator (Orbiter) for 20 minutes and at least make returning to the Moon look exciting to a library room full of kids and adults. Because it is exciting. 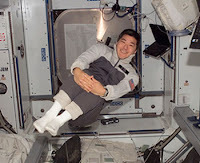 I am excited about it and I share that excitement when I talk about space and show these simulated spaceflights. I know it's just a simulation, and really doing it is a lot harder. 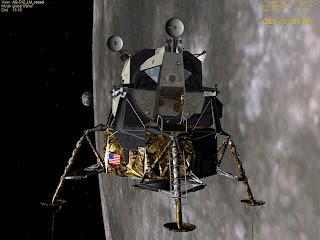 NASA is not alone in holding the keys to the future, Apollo is a tough act to follow, and 2001 unfortunately wasn't 2001. But I can see why some people are disappointed. As a JPL Solar System Ambassador (volunteer informal educator), I occasionally receive educational materials from JPL (usually DVD's and CD-ROM's) that I can use in preparing or presenting educational events. I just received one called "Field Trip to the Moon" (FTM), which was actually produced by the American Museum of Natural History with support from NASA. It uses a future Moon mission in NASA's Constellation program as a framework for introducing some basic ideas of spaceflight and of the Earth-Moon system. I just watched the 20 minute narrated film, and my first reaction was that they could have made better use of the NASA visuals for the Constellation program, many of which are quite good (see multimedia features here). There's an extended simulation of the Ares V being rolled from the VAB to the launch pad, and there are some shots of the Orion (crew exploration vehicle) and the Altair (the new name for the lunar lander). I was also less than impressed with the narration, which seemed to lack focus as it first gave a tour of Earth surface features, then talked about satellites in general, then the Earth's magnetosphere, cosmic rays, and finally some facts about the Moon itself. There's a simulation of a landing at Taurus-Littrow, but they don't use any external views of the spacecraft's approach, so it doesn't especially feel like a landing. Then I reviewed the accompanying web site and realize that it's partly a matter of perspective. This is a science enrichment presentation for grades 3 and up that is normally done in the planetarium dome at AMNH in New York City with a live narrator. 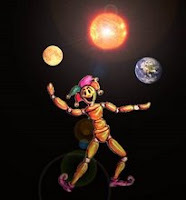 As with all planetarium shows, the narration must assume a general audience of various ages and with typically little background in space subjects. I also realized that I was comparing the visuals to my own experience with Orbiter - and Orbiter is definitely better, though of course also more complex to use. And while Orbiter is focused on simulating spaceflight with accurate physics and good 3D visuals, FTM is really using a future return to the Moon as a framework for introducing various science topics. Combined with the student and educator guides (PDF's on the web site), it seems pretty good for this, though I still think the visuals could have done a better job at making it feel something like a space flight while still meeting the science coverage goals. Teachers can contact AMNH to get a free DVD for classroom use. Orbiter is also a lot more "do it yourself" than a video, but if you are up for it, there are great Moon simulation and exploration resources available, including AMSO for re-creating Apollo missions, and several add-ons for simulating the Constellation program, though some of them are works-in-progress (as is the Constellation program). Some discussion here, Francis Drake's Constellation spacecraft here (this zip seems to be the latest version, shown in my screen shot), and Antonio Maia's Ares I here. 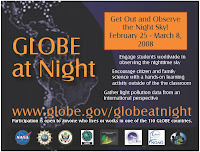 Come join us for the 2008 GLOBE at Night Campaign from 25 February - 8 March. 2008 marks a monumental shift in human history when more than half the people on Earth are expected to be living in cities. Because of the ambient light of urban landscapes, many city dwellers have never seen a sky full of stars. The Florida weather cooperated and Atlantis (STS-122) is on its way to the International Space Station to deliver the long-delayed European Columbus science module. Beautiful launch! 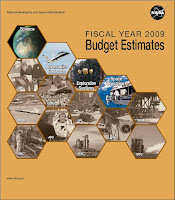 Budgets don't make for fun reading, but the FY2009 estimated budget for NASA contains some reasonably good news. The president's request for NASA is $17.6 billion, a 1.8% increase over FY2008, and it represents about 0.6% of the federal budget. It looks like space science and support for commercial space developments (COTS, etc.) are in pretty good shape, though it appears that funding for education has taken a hit if I'm reading it right (though they also split out some facilities and logistical aspects of the budget in a different way this year, so that may account for some differences). The science portion includes funding for two new Earth-monitoring satellites as well as expanded lunar and outer planets exploration. I've really only looked over the summary and read the brief introductory remarks of NASA Deputy Administrator Shana Dale, both found here (along with the full document, 5.9 MB PDF). You can find more discussion at the Planetary Society and I'm sure many other sites around the web. I bought a wireless home weather monitoring kit from Oregon Scientific (base station and two remote temperature transmitters like this, but it was a lot cheaper when I ordered it). While checking out the Oregon Scientific web site, I noticed another product, their waterproof video "Action Cam." You can use it while snorkeling, or you can attach it to a helmet or a bike or (naturally enough) a rocket. I don't really need something like this (which is only vaguely related to whether I will get one), but I decided to check out the sample videos anyway, and was immediately drawn to the rocket launches. This camera is small but not tiny, about half a pound (maybe 250 grams), so it requires a sizable rocket to launch it. Some of the results (example above) are pretty cool. Of course this is not the only rocket video camera on the market. Search for rocketcam on YouTube and you'll find many other examples, like this one. I especially like the kid's voice saying "three, two..." quickly followed by the adult's voice saying "hey, wait, wait!" as he finishes checking the camera and walks away. Safety first! I've read some things about "the hydrogen economy" as a component of future energy solutions. Of course hydrogen is more of a storage medium than a primary source of energy, and current methods of producing hydrogen are not especially efficient, especially those that start with natural gas as the raw material. But water is H2O and there is a lot of it on Earth - can't we get hydrogen from water? Sure, the well-known method is called electrolysis of water, but it takes quite a lot of energy. According to this Technology Review article, a new solar hydrogen generator could make producing hydrogen from water a lot more practical. Nanoptek in Maynard, Massachusetts has a new process based on a nano-engineered catalyst. The special molecular structure allows lower-energy visible light photons to drive the reaction that separates the hydrogen and oxygen in the water, making the whole process more efficient and potentially cost-competitive with methods based on natural gas. 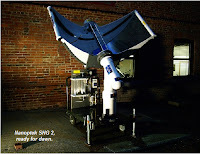 They use solar concentrators to increase the available energy on the small conversion devices. Different size collectors and hydrogen collection and storage systems could make the process scalable so that hydrogen could be produced close to where it is needed, as long as there is enough available sunlight.